“Percy Jackson” is based on the first book in a series written by Rick Riordan. The books and the movie follow young Percy Jackson (Logan Lerman) as he discovers his ancestry and the abilities he owes to that ancestry. 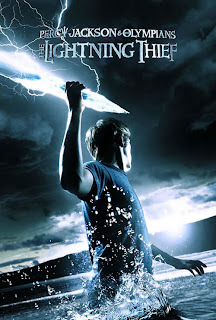 All in one day, Jackson learns he is the son of Poseidon, the Greek god of the seas, and he is in great danger. He is transported to Camp Half Blood by his caretaker Grover (Brandon T. Jackson) who turns out to be a satyr. At Camp he is reacquainted with his former teacher Chiron (Pierce Brosnan) who turns out to be a centaur. As you can tell, it’s quite an exciting day for Percy. Before he knows what has hit him he is thrown into a world in which the stories of mythology are very real. He, Grover, and his new friend Annabeth (Alexandra Daddario) soon set out on a quest to track down the god Zeus’s stolen lightning bolt. I give these books a whole hearted “eh.” The stories are interesting enough but the writing is marginal at best. In truth they come across as yet another attempt to replicate the magic of the Harry Potter series. But whereas the Potter books are written for children but sophisticated enough for adults, most of the knock offs are childish and immature. They only become popular because Potter fans are always attempting to find that next fix to fill the void left by the ending of the Potter world. So what happens, you may ask, when you take sloppy and average source material and attempt to hastily turn it into a feature film? Well, you get crap like this movie. “Percy Jackson” was, for all intents and purposes, worthless. I tried to will myself to ignore the inane dialogue and witless comedic relief. I tried to pretend like the early special effects weren’t pathetic. I even tried to convince myself it wasn’t that bad and I was in fact enjoying my movie going experience. But within about 15 minutes I was contemplating whether or not I could get a refund for this mess. The acting of Lerman and Daddario is bad but truthfully I expected that. Both are fairly inexperienced and usually your first turn as a leading character is rough. The rest of the cast, however, have no such excuse. Pierce Brosnan, Joe Pantoliano, Catherin Keener, etc. all feel as if they’re here only to collect a paycheck. (Joey Pants! What the heck happened, man?! You haven’t been in a real movie in years and THIS is your triumphant return? You were in “The Matrix” dude, come on!) Uma Thurman, Rosario Dawson, and Steve Coogan all stop in for cameos and all sleepwalk through their respective scenes. Jackson, however, is the worst of the worst. And I don’t just mean this film in particular; I mean in all of Hollywood, this is my least favorite kind of acting. When comic relief isn’t comical, it makes a decent movie seem bad and a bad movie seem miserable. This is the latter. Jackson is AWFUL and every cliché line he speaks only serves to highlight the low quality writing and acting you are currently subjecting your brain to. Writing and direction are even worse in “Jackson” than the acting. Screenwriter Craig Titley truly lives up to his IMDB resume that is “highlighted” by his writing of the story (not the script) for “Cheaper by the Dozen.” Dialogue, scene structure, you name it, it’s bad. And then there’s Chris Columbus and his sloppy work behind the camera. There was a time when Columbus was one of the premier family-movie-makers in the industry. “Mrs. Doubtfire,” the first two “Harry Potter” films, and of course, one of my all time favorites, “Home Alone” were all excellent works of kid-friendly fare that had at least some adult appeal as well. Then came “Rent,” “I Love You, Beth Cooper,” and now this. Suddenly he’s looking like a guy who’s on his last legs. The actors don’t seem as if they’ve been challenged in any way and the plot lines are laughable. “Jackson” doesn’t even have the decency to come across as desperate. Instead it seems uncaring and haphazard, like Columbus knew he had a pile of trash on his hands and there was no way to make it look like anything but a pile of trash so he just threw it on the screen and hoped enough fans of the book would show up to break even. The best comparison I can make about this would be to call it “High School Musical” without the musical. It is of that quality or lower. The final act of “Jackson” has some decent action sequences which keep this movie from being a complete and total loss. But it’s pretty darn close. This is lazy, sloppy, and careless filmmaking based on source material of the same ilk. Like the books, it doesn’t fill the void left by the soon-to-be-concluded “Potter” films but rather leaves the viewer wishing those “Potter” films could just keep going.